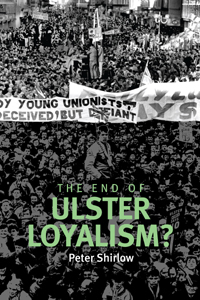 PAUL MULDOON highlighted The End of Ulster Loyalism? as one of his ‘Books of the Year 2012’ in last weeks The Times Literary Supplement. PAUL MULDOON: “I was greatly taken with Kevin Barry’s Dark Lies the Island (Cape), a collection of hilarious and, often, hair-raising short stories that range from an account of a day trip to Llandudno by a bevy of Real Alers to an unlikely take on “The Mainland Campaign” and the “nordy” world picture. One aspect of the Northern Irish milieu is also explored with admirable dexterity in Peter Shirlow’s The End of Ulster Loyalism? (Manchester University Press). This is a highly fraught subject, of course, with the ongoing investigation of alleged collusion between the police and senior members of the Ulster Volunteer Force. The idea that some UVF men were police informers would not be lost on John Honeyman. Born like myself in Armagh and, like myself, a resident of Griggstown, NJ, Honeyman is reputed to have been a spy for George Washington. Honeyman, like myself, has a walk-on part in Robert Sullivan’s haunting documentary, My American Revolution (Farrar, Straus and Giroux). Category: Law, Politics	1 Comment.